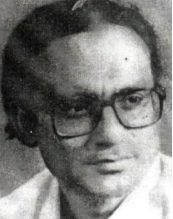 Bhaskar Chakrabarty‘s (1943-2003) poetry is synonymous with the romantic melancholia of Kolkata - a marooning alienation suffered by both young and old, inescapable, a sadly beautiful trapped-state from which there might exist an escape, but into a world of non-poetry. A whole generation of poets living in Kolkata in the 1960s and 70s wrote like him, but none can canon a karuN ras (juice of sadness), metropolitan isolation and meandering disconsolateness like Bhaskar. There is a subtle sentimentality in his lucid prose poems which validates an important dimension of an innately oriental urban modernity which often disgust western criticism. From his maiden voyage Sheetkaal Kabe Asabe Suparna (When Will It be Winter, Suparna, 1971), his first book of poems, Bhaskar Chakrabarty immediately drew attention, often hailed as one of the best poets in the city. A loner by nature, he stayed away from limelight and commotion all his life. Bhaskar has authored eight books of poetry and rarely wrote prose. He fell prey to lung cancer in 2003. Never try to find out how I had lost myself. Too many people get lost. To be frank. Our new clothes, table lamps stay up prim and proper – and a teardrop of suddenness trickles down in the verandah, it gets dark soon. Look, I had grained into beings like dust. Spent a whole life in tiny rooms, on the street, at the edge of the drains – watching angels slide into slumber while washing cheap crockery in tea-stalls. Unknown humans – I loved you all. Iron-waves and of stones, I wished you could carry me like a fountain – didn’t want the house to look haunted – when the breeze will flirt with the floral curtains in your windows, when from your dark, grim office furniture will bubble bloat dreams, remember, I played my part too somewhere in there – like a dry tranquility – colorless, singular. enthusing from leaf to leaf ultimately to the interior. Standing on the dark terrace I think of our empty lives. pacing fills up and down - that's my life. And bright new pills all wrapped in shiny zinc paper. I think again of us sitting on our cuddled chairs. wooden case - come sing to us now.